Whatever I have said about Charles Jenkins before, at least he is trying to set things right now. Back in the military after nearly 40 years in North Korea, the American is accused of deserting his patrol along the Demilitarized Zone in January, 1965, defecting and aiding one of the world's most secretive and xenophobic governments. Sgt. Jenkins, with his Japanese wife and daughters at his side, surrendered to U.S. army officials at this base just south of Tokyo on Saturday. After two days off, he reported to his new unit on Monday, army spokesman Major John Amberg said. 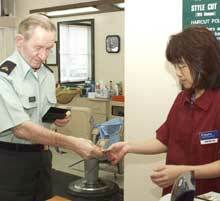 While Jenkins spends his days filing or other mundane duties, his family has moved onto a US base in Japan. I had said that the US might us the poor health excuse to avoid prosecuting Jenkins, but he was only out for two months before turning himself in. You have to at least give him credit for that. My instincts tell me that Jenkins was kidnapped and that he is telling the truth about his fated years spent in NK; however the only difficulty is that the US army found a letter in his barracks stating that he was going to defect. If this can be made more clear by Jenkins, all will be well. From what I read I am willing to give this guy the benefit of the doubt for now. His trial will be very interesting but I don't see him doing jail time. I agree with GI Korea. As far as I know, Jenkins has never asked or begged for special treatment or forgiveness from America. He did what he did some 40 years ago, and now he's willing to face the music. I say give the guy a slap on the wrist and let him be. jennkings is another white trash burger flipper that is teaching english in Qorea. He only has a 7 grade education wich is more then most english teachers. Its obvous he has "yellow feaver" and he is stealing the asian women. Learn how to spell, idiot. Such post only demean Korean and Koreans. Show some pride for a change. kimchipig - Re: 'DiaKorea', "A waste is a terrible thing to mind." I always found it ironic that those who were harshest on Jenkins (throw the UCMJ at him! Let him rot!) were those who had never been anywhere near the military in their life - except maybe as a guest, to eat on base - while the military people I know were if not sympathetic, at least merciful. I-D-I-O-T. IDIOT. See I can spell IDIOT. But Gimchipig, you are still gimchipig. I can be consoled in that the Korean kids I know here in Canada are highly intelligent and motivated to learn and do well for themselves and their families. However, they are not "Netizens." mr kimchipig, do the parents of the young korean children you hang around with know you are "hanging around". That sounds very creepy sir. Perhaps you should consiter hanging out with people your age. Maybe that kimchipig is a "pedo". or maybe he has stunted emotional growth and hanging out with children is all he can handle. In either way its bizarre.